The 'original' 6mmX (20-degree shoulder) resulted from chambering a barrel using a .243 Winchester reamer held (stopped) 0.132 inches short of its intended depth. This was done to allow use of a .22-.250 case. The 6mmX sizing die was made by shortening a .243 Winchester die (seating die also) 0.145 inches (additional length was based on varying shellholder heights; this ensured the case could be run fully into the die and attain adequate case shoulder contact). We then took a .22-.250 case and ran it fully into this sizing die and then loaded the rounds and fire-formed the case in the 6mmX chamber. The .22-.250 case neck could initially be expanded using the sizing die provided a tapered (.17 cal. to 6mm [.243 cal.]) Redding expander was installed or that the expander had been modified with a taper. The 6XC (30-degree case shoulder) cartridge came about as a natural progression from shooting the original 6mmX. The 6XC has some features which I feel are more desirable compared to the 6mmX. 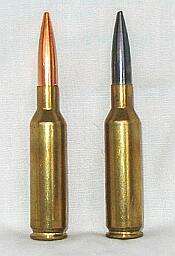 The cartridge case body length is 0.023" shorter than the 6mmX. This means that a 6XC chamber reamer now cuts the base of the case closer to the original .22-.250 base diameter. Shortening the case body also allows for less longitudinal (length) stretching during fire-forming. This will result in the 6mmXC having a greater case life (more firings). The 6XC's 30-degree case shoulder retards case growth (less trimming required). I have found that velocities attainable with the 6XC are equivalent to those attainable using .243 Winchester. Barrel life is much better than .243 Winchester due to the fact that the 6XC has about 7 grains less powder capacity. 1. 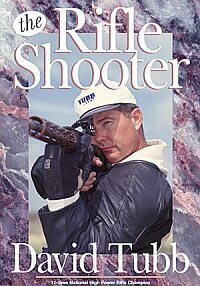 The 6XC won the NRA High Power Rifle Nat'l Championship the last four years. 2. With the 115gr DTAC, the 6XC is now a viable long-range cartridge with ballistics that rival a 6.5-284 shooting a 142gr SMK at 2950 fps. This means that a Cross-course shooter can now use one rifle and one cartridge for all events. To order DTAC 115gr bullets or 6XC brass, contact Superior Shooting Systems: (806) 323-9488. Bullets cost $18/100 with a 500-ct minimum. Tubb-headstamp 6XC brass runs $32/100. CARTRIDGE PROPERTIES: Water capacity of the Superior Shooting Systems Inc. (DTAC) 6XC case is just under 50 grains capacity. Case neck length is .305 inches so a 115 gr. DTAC bullet seated .015 inches in front of the neck-shoulder junction will have .290 inches of neck support at the start of use in a newly chambered barrel. This allows one to keep seating the bullet outward as the throat wears and yet have plenty of case support for the bullet over the life of the barrel. I have used less than .170 inches of neck support with good results when feeding out of the magazine. Seating the 115 gr bullet about .015 inches in front of the neck-shoulder junction gives an approximate overall length (OAL) of 2.750 inches, which will allow you to grow your round (for magazine feeding) more than .100 inches when using a Tubb 2000 magazine. NECK PREP: I neck turn all of my long range brass and clean it up to approximately a 60-percent level. I just try to eliminate any overly thick necks or high spots. BALLISTICS: The 115-grain DTAC has approximately 10 points lower BC than a 142gr 6.5mm Sierra. Everybody's BC calculations vary so I believe this is the best way to evaluate it against the 142gr 6.5 Sierra. (Also if you look at the Berger 115gr 6mm keep in mind that Bergers BC's are not conservative at all.) This means that if you shoot the DTAC 115 at 3000 fps verses the Sierra 142 at 2950 fps then the drift at 1000 yards is virtually the same. I use moly-coated bullets exclusively, so the loads listed need to be reduced 1-1/2 grains if an uncoated bullet is substituted. All of my long range loads are seated long and are pushed back into the case upon the closing of the T2K bolt. Likewise, all of my long range loads are full-length resized each and every time (approximately .003 inches shoulder set back). 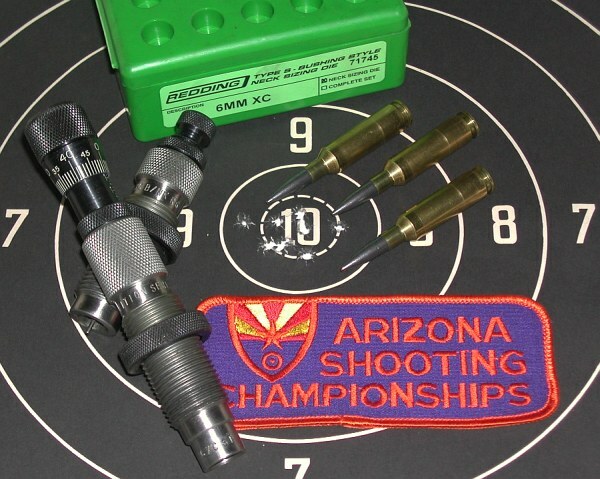 I use the Superior Shooting Systems Custom 6XC die set (see below). I used the .268 bushing in the sizing die with the expander plug (for long range only; I use a smaller bushing for across the course rounds). PRIMERS: I have been using Russian primers exclusively. They use a different sinoxide (close to the European type) compound mix which (in my testing) consistently delivers better extreme spreads over Federal 210's. Be sure they are seated firmly into the case--if not they can be hard to ignite. POWDER: I tried Hodgdon H4831 but could never get the velocity I wanted out of a 27-inch barrel; with this powder velocity without any brass flow (shiny spot) on the ejector plug was around 2930 fps. (4831 might be worth a try if one has a 32-inch barrel). I ended up with H4350 -- the same powder I use with my 107 gr. Sierra bullets in this cartridge. I use the ejector plug brass flow as my pressure indicator -- when I see a shiny mark on the case head I automatically back off the charge 1/2 grain. I have shot the DTAC 115 at over 3100 fps but saw too much pressure. I can shoot this 115 at 3050 fps and have a reloadable/reusable case; however, out of my 7.5 twist barrel it did not shoot as well as when I backed the load down another 1/2 grain to 39.6 gr. of H4350. This gave a velocity (depending on temperature) of anywhere from 2988 to 3020 fps. When I got home from Camp Perry I rechronographed the ammunition I used there and it was going 2990 fps (early morning, cooler temp. ); mind you, this was several hundred rounds later in the barrel's life. I shot four different 6XC barrels (three were 7.5 twists and one 8 twist) this past season and they all shot the same. I did quite a bit of testing at 1000 yards -- 20-shot groups prone -- and the best group (27-inch barrel, 7.5 twist) was 5.5 inches elevation for 20 shots (group was about 15 inches wide -- wind was blowing but somewhat steady and the target was marked after each shot). The group shown in the photo was shot with a 29" barrel (7.5 twist) and the conditions were almost calm -- also keep in mind that I can't hold much better than a 3-inch spotter when shooting prone at 1000 yards. I feel that the 6XC cartridge will continue winning for some time to come since it now offers a good long range bullet with a decent BC, lower recoil than a .308 or 6.5x284, and because of the fact that it is a very easy cartridge to load for (i.e. develop and tune very accurate loads). Click here to download the lastest Load Data (and loading advice) for the 6XC as a .PDF file. Two neck/shoulder sizing bushings are included with the die set. One is .265 diameter, one is .267 diameter. Depending on the make and lot of brass you're using, there may be different neck wall thicknesses. I choose a bushing that gives me 0.003-plus case neck tension on the bullet. In other words, I measure the sized case neck inside diameter and want that to be 0.003 smaller, or slightly more, than the actual bullet diameter (0.243 inches). Due to differences in wall thickness and brass characteristics, different brands and lots of brass may size "differently" than others. The best way to proceed might be to size a few cases using each bushing and see what the end results are by measuring outside case neck diameters before and after seating a bullet into them. That is the sure way to determine case neck tension, and, therefore, which bushing to choose for routine sizing use. Another way to do it is measure the outside diameter of the case neck of a loaded round and subtract 0.004 from that figure (accounting for spring back in the brass); use the bushing that is closest to that figure, but err on the side of the smaller bushing. My experience has been that the only real danger is having too little neck tension to hold the bullet (less than 0.002" difference). New 6XC brass, ready to shoot out of the box, is available from Superior Shooting Systems. You don't have to worry about forming the cases out of .22-250 brass any more. The rim thickness is that of a 308 case (.049) so you won't need a different shellholder (.22-250 is .044" rim thickness). The web specified for this case is similar to the .338 Lapua. This gives a much stronger back end as well as more uniform powder ignition. A Neco gauge on the web showed right at .002" runout on the body wall. The brass is much more affordable than Lapua or Norma brass. Prices for the Third Batch of 6XC brass are now $32 per hundred and $30 per thousand. Order from Superior Shooting Systems, (806) 323-9488. Incidentally, the Third Batch of brass is due in approximately 2 weeks (we will have hopefully filled all the backorders by the end of Nov.) The Third Batch of 6XC brass is approximately six points harder than Lapua (on the Knupe scale), which means that there will not be any stickiness at the top of the bolt lift. 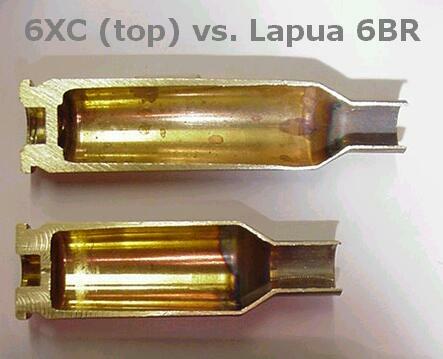 6XC brass can also be formed, without great difficulty, from 22-250 brass. Larry Medler has developed an effective case-forming method that avoids the "mushrooming" you can get using 6XC forming dies with a standard shell-holder. Click Here for a fully-illustrated guide to 6XC case-forming. Norma Precision AB S0670 40, ?matfors, Sweden and David Tubb of Superior Shooting Systems Inc., Canadian, Texas USA announce their collaboration to make and import 6XC brass in the U.S. and European markets. This follows more than two years of developmental work on the 6XC cartridge by Norma. Case head hardness of the new 6XC brass will be on par with the best and hardest commercially-manufactured cartridge brass. Hardness is important for best use in a repeating rifle, especially one used for NRA High Power and Long Range competition. The Norma standard for body wall runout is .002 inches or less at the base of the case. The new brass features a large rifle sized primer pocket. A detailed study of large and small rifle primers showed that large rifle primers worked best when the propellant charge exceeds 35 grains as is the case with the 6XC. Pressure data indicates higher attainable velocities compared to a standard .243 Winchester cartridge. The 6XC attains these higher velocities with less propellant and lower pressures (superior case design is the reason). The 6XC has dominated the across-the-course portion of the NRA High Power Rifle National Championships at Camp Perry as well as the NRA High Power Rifle Long Range events. Norma has high hopes for the 6XC as the next dominant ISU 300 Meter cartridge in Europe. Norma's test shooter disclosed that his recent 6XC barrel had fired smaller groups than his previous ten 6BR barrels. Norma also offers loaded factory ammunition. Superior Shooting Systems Inc. currently offers 6XC loaded ammunition featuring the 115-grain DTAC bullet. Norma 6XC brass will be headstamped "Norma 6XC". Superior Shooting Systems Inc. sells the Tubb 6XC brass made by Silver State Armory as well as the excellent Norma brass. Hugh Henriksen, (541) 535-2309, makes the 6XC reamers for us and we usually have his reamers in stock. The reamer I now use is compatible with either the 107 or the 115. My current Henriksen reamer (used for the last two years) has a 3/4 degree lead with about .050" of straight section. I like this for the 115s in the 6XC. A meplat-uniformed 115 seated in the 6XC should be just off of the rifling with an OAL of approximately 2.740". We also stock "Go" and "No-Go" 6XC gauges. 6XC chamber reamers are also available from other sources, including Pacific Tool & Gauge, (541) 826-5808. Superior Shooting Systems contracted to have custom sizing dies made. 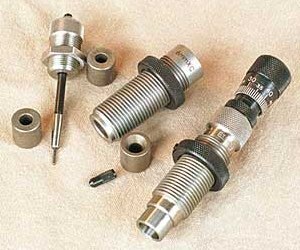 These are packaged in a 6XC Die Set with a Redding-made micrometer bullet seater. The sizing dies feature neck AND shoulder sizing bushings, not just the neck bushings used by Redding and most others. Our Die Set has additional features that make it work better for case-forming, such as a tapered expander. 6XC Die Sets are in stock and shipping. Prices are $61 for the seater and $119 for the resize die, and full instructions are included. A comparable resizing die from Neil Jones is $175 without any bushings. Click here to download 6XC Die Specs and Reloading Instructions as a .PDF file. 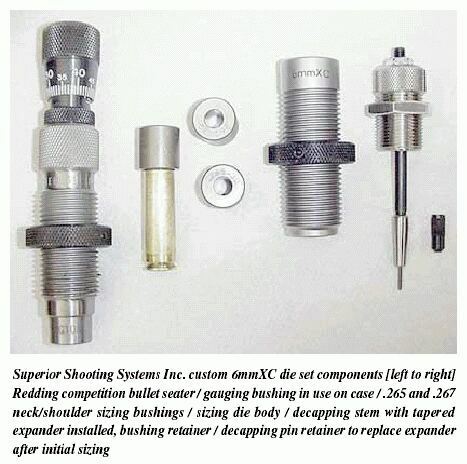 In addition to the Superior Shooting Systems Inc. custom 6XC die sets, Redding now has its own version of 6XC dies, and they work very well. The full range of Redding dies is offered, including Competition Micrometer seater dies, and Type 'S' full-length bushing dies. See photo below. Forster Products also has 6XC die sets available. Conclusion: Is the 6XC the Ultimate Cross-Course Round? "I think so. I have now won three Camp Perry Across the Course National Championships and one Long Range National using the 6XC. Norm Houle won this year's Across the Course National Championship (using the 6XC and 115's at the longer ranges). This round continues to impress me and I'll be with it across the course for the foreseeable future. In addition to eliminating the problems associated with magazine length round bullet seating (keeping the bullet's full caliber diameter out of the "doughnut"), the 6XC is the best feeding round I've used. Any shorter doesn't work as well and any longer doesn't either. The XC is the ideal across-the-course round." Copyright ? 2004, David Tubb, Zedicker.com and 6mmBR.com, All Rights Reserved.